I hope you enjoy it as much as I did. She has many great stories, and she works hard as a writer. I am thankful she is in my friend and in my life. Posted on December 8, 2016, in Watercolor Paintings and tagged acrylic paintings, art, Chinese watercolor painting, Koi Fish, pencil, Sea turtles, Sumi-e: The Art of Japanese Ink Painting, watercolor painting. Bookmark the permalink. 23 Comments. Hi Patsy, I came over from the Summerhouse to tell you what a gorgeous fox that is!! No wonder she had tears in her eyes when she opened it! You are the essence of a wonderful friend. What a sweet and beautiful gift to give her. 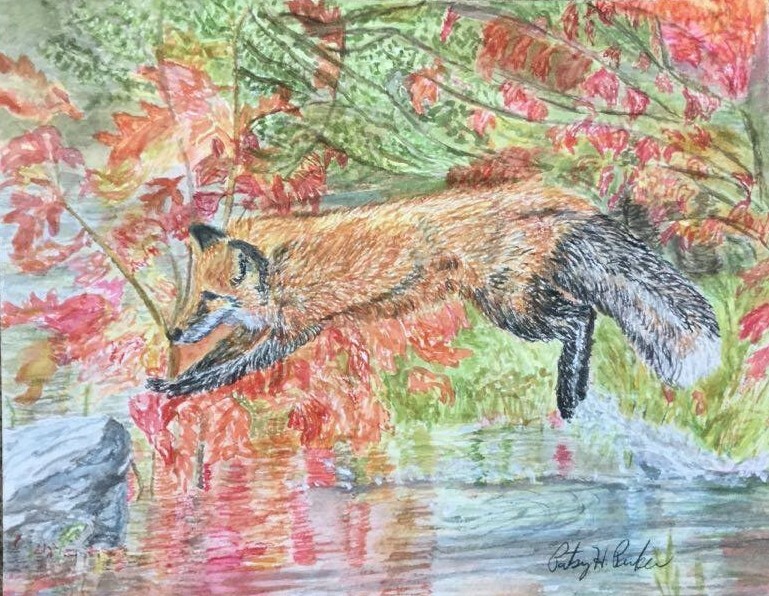 Love the autumn leaf colors in the painting and your fox is a stunner. Thanks so much Bespoke! I will pop over to your blog and take a look as well! It’s lovely how we make these special friendships via blogging. There is nothing like a shared interest to draw people together. What a lovely post, and image. Thanks, Elena! I appreciate that so much. 🙂 I am really loving all of your photography on Facebook! You really get some incredible shots! Are you painting any of them?